You guys, my fourth blogging anniversary is this Friday! 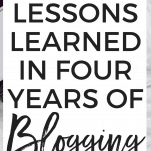 It’s so hard for me to believe I’ve already been blogging for four years. I started this blog in 2014 out of a desperate need for a creative outlet. Writing has been a super passion of mine literally for as long as I can remember and after college, I was getting the itch to start writing for myself again. What started as a personal blog that I’m quite certain no one but my mom read has turned into an awesome side hustle that allows me to make a bit of extra income. I’ve learned so much about blogging and running an online business over the past four years, and today I want to share some of those blogging lessons with you! I feel like I hear the word “overnight success” thrown around a lot in the blogging world. People discover a new blogger who has become really popular and is starting to make a lot of money, and they assume it was an overnight success. Here’s the thing though – there’s no such thing. Blogging is a heck of a lot of work, and success and growth happen slowly. Sure, there are bloggers that grow and monetize a lot of faster than others, but you aren’t seeing the behind-the-scenes work and the late nights that went into that growth. When it comes to growing your blog, start with the basics. Work on building a solid foundation so when you’re ready to grow and monetize, those building blocks are already there. Then, when people start paying attention, you’ll look like the overnight success. One thing I love about blogging is that it’s a side hustle you can start, grow, and monetize for very little money. 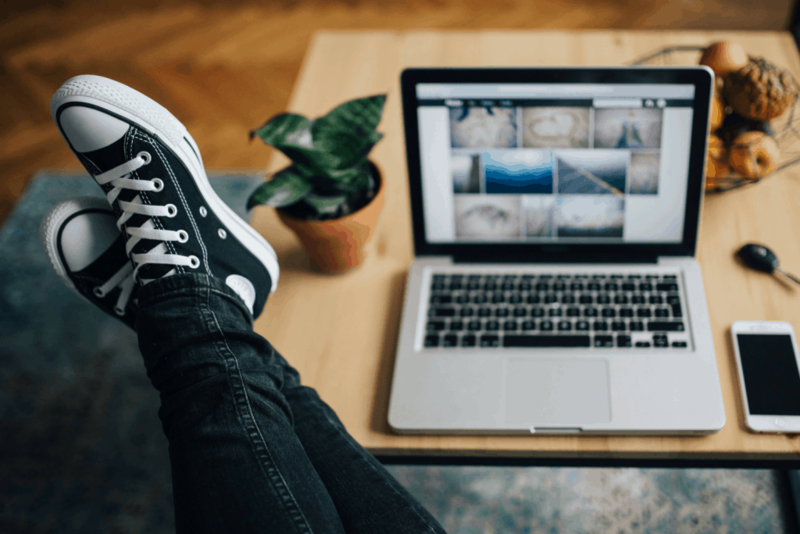 The real costs associated with getting a blog set up CAN be quite minimal (depending on what you’re hoping to accomplish). However, I firmly believe that building a real blog that you can turn into a business is going to take some investment. Most of the investment will come in the form of time. I honestly can’t tell you the number of hours I put into my blog when I first started it, and even the number of hours I put in now. I guarantee there have been weeks where I spent more hours on my business than on my full-time job. There is also going to be some monetary investment. When you first start your blog, you’ll likely be paying for costs such as a domain name, hosting, and a blog design. Over time you’ll add additional costs, such as social media scheduling tools and an email service provider. And over time, I hope you’ll invest in some blogging education products. 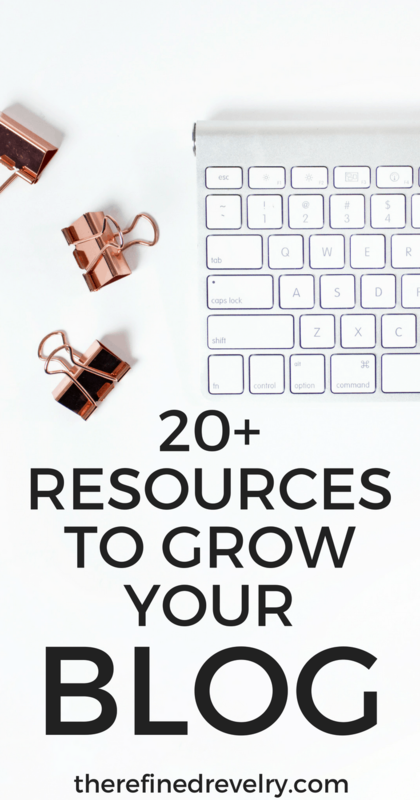 There are so many awesome eBooks and online courses out there that can help you grow your blog! To check out a comprehensive list of my FAVORITE blogging products, check out my blogging tools and resources list. As someone who is a bit of a perfectionist, this one felt really important for me to share. Often, perfectionism might seem like a great asset. And to a degree, it is. But it can also be a huge hindrance. Often when I write something, I publish it far later than I should have, simply because I wasn’t convinced it was quite right. I do the same thing at work, proofreading pieces dozens of times for fear of finding a spelling error. So while perfectionism is at times an asset, it’s also a significant time waster and something that can cause really great work to never see the light of day. Rather than working on something until it’s perfect, work on it until you’re proud of the work you put into it and feel that it’s a genuinely good product. Sometimes that might mean putting out an A- piece of work instead of an A+ piece of work, but done is better than perfect. If I never published anything until it was perfect, I would never publish anything at all. But I’ve learned that my best work is as close to perfect as I need to get. When I FIRST started blogging, I did pretty much nothing to educate myself on the business of blogging. Mostly because I had no idea it could be a business! But once I figured out you could actually make money from this whole blogging thing, I threw myself into learning everything I could about growing and monetizing my blog. And now, years later, I still haven’t stopped learning. I still invest in eBooks and courses fairly regularly and still find teachers that totally blow my mind with what they’re teaching. Blogging is one of those industries where you will literally never run out of things to learn about. First of all, there is SO much to learn. There are so many different facets to blogging and most of us only dip our toes into some of them. Also, blogging is CONSTANTLY changing, and you have to keep learning to keep up! Traffic Transformation – This is a super actionable eBook that shares the exact steps to take to increase your blog traffic, potentially by hundreds of thousands of views per month. Pinning Perfect – This course teaches you how to optimize your site for Pinterest and gives you a Pinterest strategy to drive a ton of traffic. I’ve taken a few Pinterest is courses and this one is without a doubt the most thorough, actionable, and effective. Making Sense of Affiliate Marketing – This is a super comprehensive guide to making money with affiliate marketing. Michelle makes over $100K per month with her blog, most of it from affiliate marketing. So you know her tips are legit. Six Figure Blogger – This course walks you through creating and selling digital products online and, as the name suggests, making six figures from your blog. 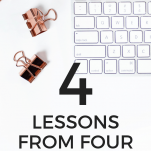 These are some of the blogging lessons I learned in the last four years, but they certainly aren’t the only ones! I couldn’t possibly list all the lessons I’ve learned. Blogging is truly a trial by error industry. You’ll make mistakes, you’ll start small, but you’ll learn. You’ll grow. I definitely agree with these. I have somewhat of a niche but I’m still way more Lifestyle than anything. I write what I write and I’m happy with that 🙂 Happy One Year! I love reading about what other bloggers have learned in their time that they have been blogging. I think that not having a defined niche is completely okay as a lifestyle blogger! I read that as long as you have a desired reader in mind and focus on that demographic, then that’s still okay! I really don’t think I would be where I am right now without networking and becoming friends with so many people in the Facebook groups that I am involved in. You really can’t blog alone! Oh my gosh, that’s so true! I can’t imagine how lonely it would be blogging without a blogging support team! All very true things! Thanks for sharing your lessons learned and congrats on one year in the blogger world! Hi Erin, a fellow member of Blog Passion Project here! I’m a few months behind you, but I completely relate to all of these points. In particular, after being super devoted to the blog and social media all summer (and seeing results from it) I’ve experienced burnout this month…and mostly because I didn’t stay ahead of creating content. I feel like I’m getting back in to it, but it is NOT easy. Thanks so much for the post, I always feel so encouraged when I read that other bloggers experience the same ups and downs I do. YES to all of these. It’s always neat to look back where we started and to see where we are now, isn’t it? Blogger burnout is so real and is probably my hugest struggle in blogging. I have all of these ideas but no time to get them done. When I want to work on a certain post, my husband will have the camera with him at work – it’s a lot to keep up with. What I plan in advance isn’t usually what happens haha. great post! Congrats on one year! Great tips, all very important to remember! Great tips! That is a great point about niches. I have a niche, but it is broad, and I do not think a niche is necessary for a successful blog. Love your blog design, by the way! Omg, I am so NOT a niche blogger either! I just added a drop down for my categories and of course I expanded my main five into 7 more coherent categories. Whoops! I love these types of posts. Two more months until my blogiversary! I’m having a hard time condescending mine to 5-7! I haven’t been blogging for an entire year yet, but I’ve definitely learned that patience is key and so is consistency. I’m still struggling with my page views but I’ll get there one day! 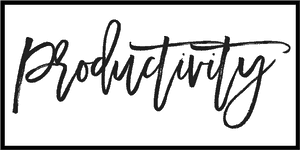 I’m in the middle of blogger burnout right now as well (just started a new school program on top of work, life, blog, etc). Falling behind on my editorial calendar was definitely the culprit, so I’m taking a brief step back to readjust! Congratulations on your blog-iversary!!! It is always amazing to look back and see how far our blogs have come! I totally agree on Blogger Burnout. Around this time last year, I took about a 9 month break from blogging because life got in the way and I hit burnout. Even now that I know about the tools and tricks to keep up with my content, I find that I may need to step away for a week or two to catch my breath. Best wishes as you move into your second year! Totally True! I feel burnout many times and sometimes I’m thinking why I even started the whole blog. It is a lot of work that it’s not paid off yet in my situation. I don’t want to give up because I built everything from scratch by myself and I’m so proud of it. It’s hard for me to let go. I want to improve more… but blogging is so much work that sometimes new bloggers don’t even know it. I stay at home with my children. But they go to school now full time so I have more time blogging. But on the other hand I’m looking for some part-time job to bring some income home. So my blog will suffer. I am not sure how I handle everything. Home + Blogging + Job… and my Etsy Shop that I love to have it, but still brings me low income. So as of today I’m working so hard and I get coffee money. Great article! I’ve only been blogging for about six months, so it’s nice to see perspective of someone who has done it longer. Great post, loved reading everything you learned on your first year of blogging! You are right about the bunt out, it happens and networking it’s really important as well. I would also add that passion is everything, it will keep you motivated knowing that you love what you are doing. I totally feel ya on this post! I’ve learned the same things! I’m glad to hear you’re finding success without being in a small niche. I’ve been told the same thing, but with my blog I want to partly write about events near me, but also write about my life and other lessons and experiences I’ve had – and those don’t generally limit me to where I live. Blogger burn out is definitely real. I usually write 3 posts a week but I only did 2 this week…I simply did not have the energy to write another post “just to post it” on Friday. Plus, it would have been forced and weak…as you said…content is king! I had a hard time with going niche. I wrote lifestyle posts for 3 years before picking one topic. That’s how I am in real life too. I didn’t find that it was being niche that made me a successful blogger but it helped me avoid burnout. I stressed about getting other types of posts in and it just wasn’t fun anymore. I’ve been a lot more happy with my projects and posts in the last month than I have been in 3 years of blogging. Also, I plan on writing an ebook (almost done yay!) and I want my email subscribers to be dedicated to that topic too so that they want to see my emails come through and then eventually they want to buy my ebook. And amen to the blogger burnout is real! I started by blog and told myself if I need to take a week off then so be it. I would hate to keep going until I hated blogging and never came back. By taking some time off I am able to refresh and restart. Oh my gosh, that’s awesome! I’m sure your ebook will be amazing! I love reading these sorts of posts…it’s always nice being able to relate to other bloggers and know that we are all kind of going through the same thing! Congrats on your first year! Keep it up! These are awesome lessons! I’m still in my first year of blogging with my current blog (had a few really small & unsuccessful ones before) and I am learning some of these for sure! Thank you for sharing! This is so helpful, Erin! Thank you so much! Network is a HUGE part of blogging! After all, if you don’t have blogger friends, what’s the fun?! Great post! I learned so much in my first year. Networking and consistency were my two big ones! I noticed such a huge change when I started focusing on those two! I couldn’t agree with these all more! Especially the point on Blogger Burnout. I also think I had no idea how long growth would take. Thanks for sharing!! Love this! I’m right there with you on not having a particular niche. I love the idea of being a lifestyle blog because there’s so many different things that go into living life fully and well. 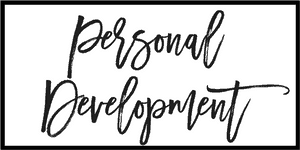 I’ve loved following your blog and learn a lot from these posts! 🙂 Thanks for putting your heart out there and blogging! Great post, Erin! 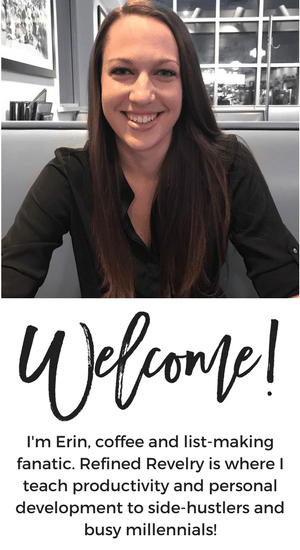 While I had grown the old blog pretty well, I’m starting from scratch with my new one and your tips are fabulous. Thanks for sharing! I love this list! I’m almost at a years worth of blogging and it’s been amazing so far. These are great lessons that all bloggers should always take into consideration! I totally agree with these, especially that content is king! Everything else we do to connect and network and promote and grow is so important, but it won’t work if the content isn’t good. I’ve also struggled with my “niche.” I started out much more specific than I am now, and though there are certain things I won’t blog about (like you, I don’t really do any fashion or beauty), I’ve tried to open myself up to be more creative. It also helps me to avoid burnout! 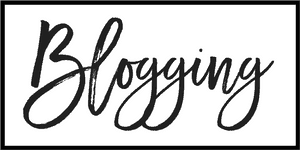 Congratulations on a year of blogging!! What a good read. I am still thinking about the “niche” you have mentioned. I has been on my mind. Jetset-diaries is a lifestyle blog but I am thinking with that title it really should have a travel focus. I feel like I have covered it with fashion, accommodations and sights but I’ve also included lifestyle posts such us a momtography or such. What do you think? I agree with all of these! And I was particularly glad to read #4. I also kept hearing “Find a niche! Find a niche!” and while I so have a general theme for my blog, I just can’t be pinned down to one specific niche. And I think that’s OK. It’s a good reminder that while it’s great to take advice, there’s not always a “one size fits all” solution that works for everyone. Networking is everything!!!!! and BLOGGER BURNOUT is REAL! You narrowed it down to the most important things that newbie bloggers need to know. Thanks for being so honest! I often wonder when the lists says “write good content” what that really means? I guess content that no ones cares about? This is fantastic advice. I’ve loved the Blog Passion Project and a couple of the other groups I’ve joined. It’s made a HUGE difference. And it’s nice to hear about that I’m not the only one feeling blogger burnout at times. It’s really hard to find a good balance and I feel like it’s an ever moving target. Thanks for this post. I loved it! Congrats on your one year! I totally agree with all of your points! Isn’t it crazy how fast the first year of blogging flies by?! This is really helpful. It is hard not to feel like every other blogger is so far ahead. I also just finished my first year. Lots to be excited about, lots I have learned and a one-tonne truck f things still to learn. Thank you for this post! I was looking for another facebook group of bloggers so thank you for sharing that one. As a new blogger it is hard to put things in perspective sometimes. I don’t really know where I want my site to go yet….I am just trying to have fun with it, Having said that I already feel like I have put in a ton of work for not a lot of traffic. One of these days I will sit down and figure out what the heck I am doing. I really appreciate the info….it helps to point me in the right direction! I love your thoughts here! I have been blogging one year as well and I don’t feel like I’m as far along as you. Thanks for the tips! I absolutely love this post. As a fairly new blogger myself (3 months) I can greatly appreciate the challenges! It’s unexpected how much I love doing it. Thanks for the great tips. If you ever have the time to check out my blog and give tips it would be greatly appreciated! Thanks so much for sharing these lessons! I’ve only been blogging for a few months so it means a lot when other bloggers share what they’ve learned along the way. P.S. I am not a niche blogger either and never want to be one! I just don’t want to limit myself in that way. This is such a great post! 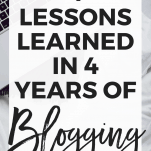 My first year of blogging has been all over the place but it really does teach you a lot… and there’s no other way for your blog to get better! For what it’s worth, I’m not a niche blogger either 😉 I am totally with you on that. I just couldn’t fit myself neatly into a box. There’s so many things I want to write about, so many things I am as a person. It’d be a shame to hide some of it just to fit into a niche, no? I had a bit of a burnout over the course of summer, but for myself I’ve found that it came from taking on too much and trying too hard to keep up with what is perceived to be the one surefire road to blogging stardom and success. Slowly redirecting now as I’ve also less time with my son going to school and needing more of my time. I just wrote a post on blogging tips for a challenge, there is just so much to learn! I feel like you can never read enough articles on blogging tips and get enough advice. I am definitely feeling blogger burnout though! Awesome tips! Yes, preparation is the key and something I need to work on. Thanks for sharing! i am just barely at my 9 month point and I feel like I have learned a lot of the similar things! I am just now realizing that I actually do have a niche. I thought I left a comment here, but I guess I didn’t! I love all of these lessons and agree with them all! Especially about making real friends! What would I do without you ladies? Thanks for confirming so much of how I am feeling! Great article – and congrats! I am fast approaching my one year anniversary too – so much more for me to learn for real! Yay for you! I love to read about what bloggers have learned over the coarse of a year. I am not at the year mark and I know I have already learned so much. Looking forward to learning more and more! I love your blog. Thanks for sharing what you have learned, helps me to keeps things in perspective. The one that resonated with me the most is the niche blogger. I definitely am a little all over the place (I blog about fashion, beauty, lifestyle topics, and soon to be wedding planning) but I feel like it works for my audience.